Jeremy Sheppard, PhD, CSCS,*D, is the Head of Strength and Conditioning at Surfing Australia, the national sporting organization for the sport of competitive surfing. Previously, he worked for the Australian Volleyball Federation, Australian Institute of Sport, Canadian Sports Institute, and college and professional teams. Along with his credentials in Olympic lifting and strength and conditioning, Sheppard completed his PhD on vertical jump testing and training methods from Edith Cowan University. He has collaborated on numerous research and educations initiatives, has published more than 50 peer-reviewed research manuscripts and abstracts, and authored 10 book chapters. Deceleration in court and field sports is important when executing certain skills (e.g., a receiver rapidly decelerating to create space from a defender to receive a pass) and to change direction. Depending on the sport, these changes in direction can occur from different approaches. For example, a ball carrier in rugby may decelerate to prepare for a cutting action ahead of a defender, and a tennis player may decelerate and execute a stroke while running laterally. To decelerate effectively, the athlete must absorb force, primarily through flexion of the ankle, knee, and hip. This action is aided by an initial rearward body lean, which is opposite to that of acceleration. The extent of the lean depends on the initial velocity of the athlete. The muscles in this action decelerate the movement of the body’s mass under a high eccentric (lengthening action) load, controlling the rate of deceleration to either a standstill or to a speed at which a change of direction or skill can be executed. The arms continue to oppose the movements of the lower body, aiding in the absorption of force and providing help to control the athlete’s balance and center of mass. Figure 2.7 illustrates the slight rearward lean and flexion (absorption of force) through the lower body to decelerate. 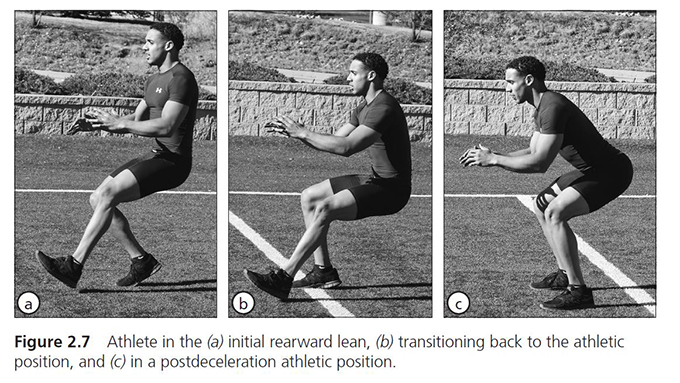 Although the initial body lean is rearward, as athletes slow, they are often required to undertake a sport-based task, which requires them to assume a traditional athletic position and the associated forward lean. Common to most situations in which deceleration occurs is the need to initiate a propulsive force soon after the deceleration. For example, an athlete may decelerate and then push off to change direction. Simply put, the athlete must reduce force (decelerate) and produce force (accelerate) in some manner, such as changing direction, jumping, tackling, and so on. Performing this task effectively is a key to multidirectional speed and agility. The key to reduction and then production of force, as in decelerating from a sprint before changing direction, is using the stretch load inherent to the eccentric action. If used well, the stretch load provided by the eccentric action can contribute greatly to the production of force in the following concentric (shortening) action. Termed a stretch-shortening cycle (SSC), this can greatly enhance force production. SSC function is influenced by the rate, magnitude, and load of the stretch, and depends on a short delay between the eccentric and concentric action. Well-developed technique allows the athlete to decelerate and change direction (or execute another skill) in a superior manner. 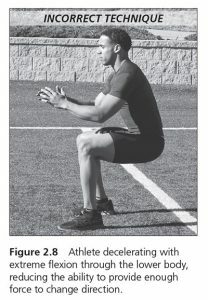 When decelerating and absorbing force through the lower body, the athlete must use a range of motion that allows enough lengthening of the muscle to reduce force and stimulate the SSC because the SSC is influenced by the magnitude of stretch. However, too much flexion reduces the athletes’ ability to exert concentric force, thereby negating the positive effects of the large magnitude of stretch and increases the delay between the eccentric and concentric action (Figure 2.8). Thus, the coaching cue to sit down low often results in poor body position. The ideal position depends on the specific requirements of the subsequent action and the specific sport. A simple method to reinforce this concept is to attempt countermovement vertical jumps from several depths. Attempting a vertical jump from a very shallow dip motion, an extremely deep motion, and then finally from a depth that the athlete feels will illicit the greatest height can help develop this concept. In most athletes, the depth that achieves the greatest jump height is an intermediate dip somewhere between very shallow (minimizing muscle length changes and maximizing speed) and extremely deep (maximizing muscle length changes but reducing speed). This depth optimizes the effective contribution of the SSC while initiating the concentric action from a position in which the muscles can produce force. The same principle applies to the magnitude of flexion of the ankles, knees, and hips when decelerating. The flexion should be deep enough to dissipate the force through the length of the stretch but not so deep that the body is unable to generate subsequent force effectively. The physical quality of absorbing, or arresting, force and subsequently accelerating during deceleration and change-of-direction sequences is often referred to as reactive strength. Training this quality includes executing effective technique in decelerating and changing direction. Safely executing this skill requires not only strength in the legs, but also body control and awareness. This is particularly important when considering the importance of reactive agility in many sports, and that during unplanned tasks (reactive changes of direction), the forces that need to be absorbed through the body are much greater than in controlled, planned deceleration, and change-of-direction tasks. This article, an excerpt from the book Developing Speed, was originally published on the website of the National Strength and Conditioning Association and is being used with permission. All text and images provided by Human Kinetics.